If you are looking for a great trip where you can see plenty of eagles, and not just from below, then consider a day at Conowingo Dam. It spans the Susquehanna River in Maryland, just before it meets the Chesapeake Bay. 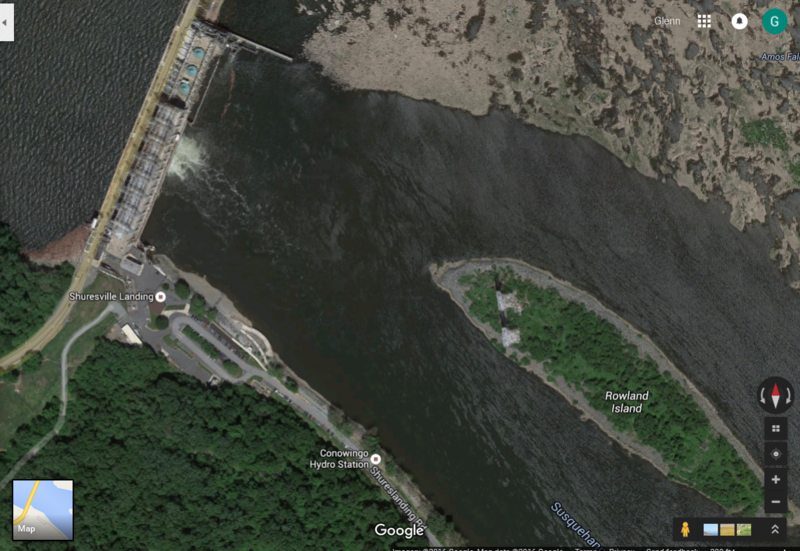 Google Map of the Conowingo Dam area, showing curved viewing area just to the left of center. Click for larger image. As the energy needs increase throughout the day, operators open flood gates, releasing water and fish that inadvertently get sucked through the turbines. The eagles have figured out that the pickings are easy and they hang out on the downstream side, waiting for snack time. In addition to eagles, with many juveniles, you can expect to see varieties of seagulls and cormorants as well. 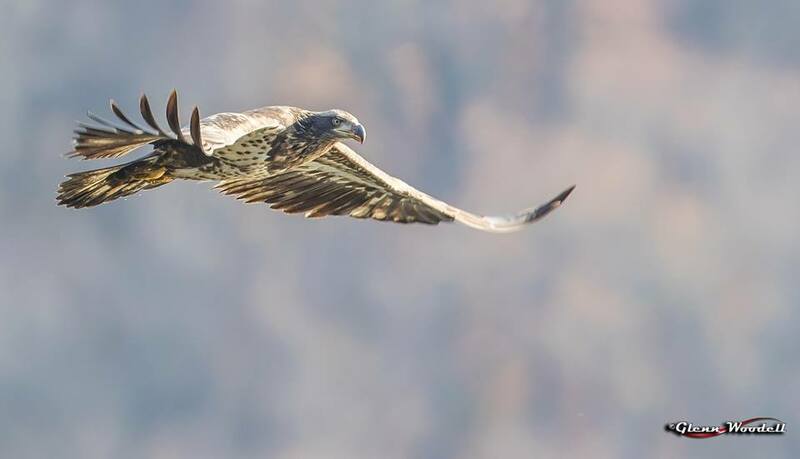 The eagles numbered more than 50 on our first trip there in November of 2015. Most were sitting in the trees and on the rocks on the far shore, outside the reach of even the longest lenses, but there was almost always some action going on in the air over the water. Although much of the action was still pretty far away, sometimes the air battles and chases brought them well into the view of traditional zooms. Juvenile eagles fighting over a meal. Click for larger image. The most common lenses there on this trip were the 600mm/f4 and 500mm/f4, about equal in quantity. 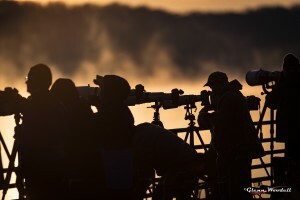 There was about an equal number of 800mm and 400mm lenses and a scattering of smaller primes and zooms. We had an assortment of bodies and lenses for the distant shots as well as for the nearby birds in flight. I took advantage of the Canon Professional Service’s evaluation program and took along a new 800mm/f5.6 lens. This image shows our arsenal for the day. 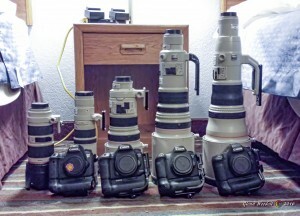 Lenses from left to right are 80-200/f2.8, 400mm/f5.6, 300mm/f2.8, 500mm/f4, and 800mm/f5.6 while the bodies included three 6D’s and a 7D MkII. The gear for the day. Click for larger image. The 500mm with the 7D MkII body gave me the full frame equivalent focal length of an 800mm lens. 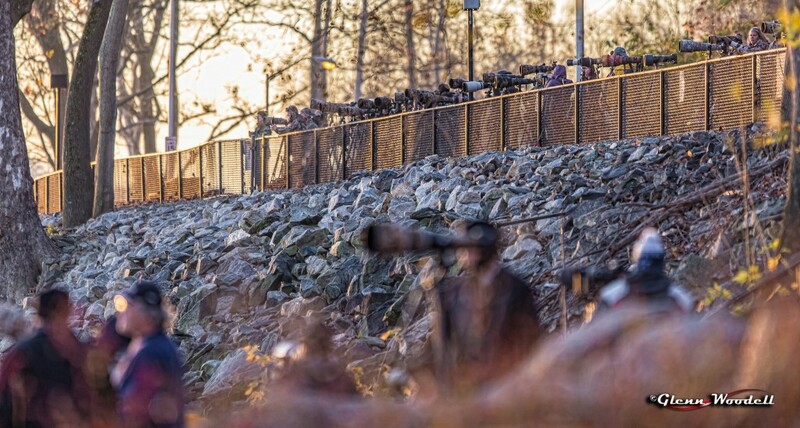 I also carried a 300mm/f2.8 on a Black Rapid strap to capture the close flybys and the occasional eagle that landed in one of the trees behind the viewing area. The 200mm was also fine for some of the closer opportunities. 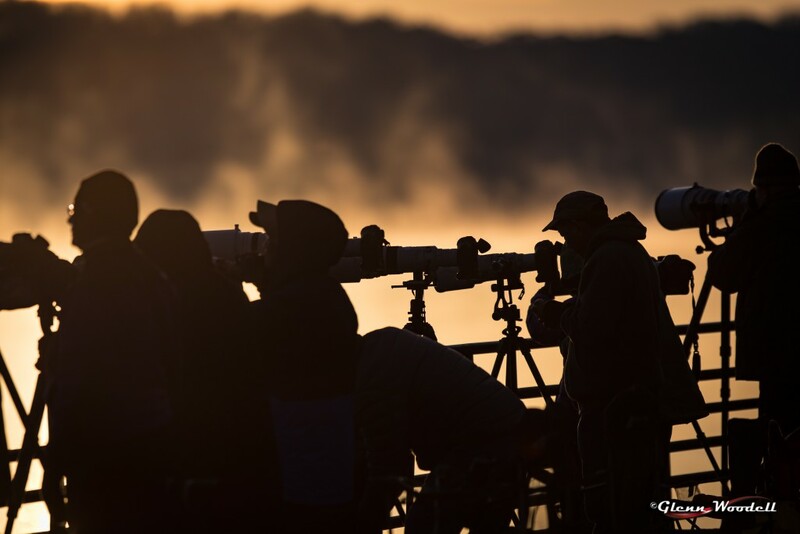 Big lenses lined up just after sunrise. Click for larger image. Upon arrival at 6:20 in the morning, the parking lot was already close to full and there were about 50 people lined up along the rail on the lower platform. 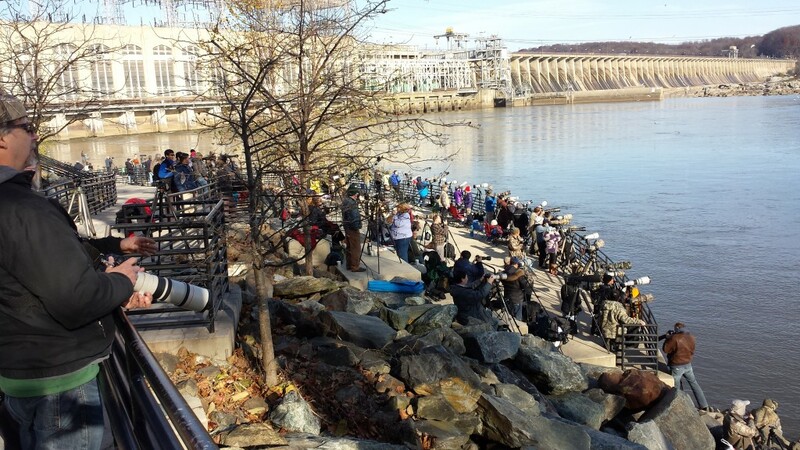 We managed to find a spot on the rail toward the dam. We soon discovered that this was not a great spot but we were still better off than many. Our viewing station at the end of the rail. Click for larger image. Although most of the action is said to happen when the gates open and fish come floating to the surface, stunned by their journey through the generators, we were lucky to see it start well before that as air battles were launched every few minutes. The seagulls were numerous as were the cormorants but the eagles were the ones who engaged in the battles. The cormorants mainly looked for easy pickings near the dam as they perched on the concrete wall while the seagulls either joined them close to the dam or scavenged below the fighting eagles farther out. Big glass everywhere! Click for larger image. The prime spot for viewing seemed to be the center of the curved, lower deck, the one we were on. There is an upper level which is a little farther from the shore and a fence which runs between the parking lot and the bank. 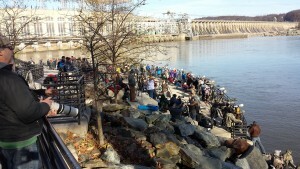 By mid-day, there were about 70 people on the upper and lower concrete areas and about an equal number on the rocks along the shore and along the fence above them. The upper concrete area has a handful of individual observation stations that are great for staying away from the crowds. They are just higher and farther back from the rail where we were. The late arrivals, lined up along the fence. Click for larger image. In just over eight hours of shooting, we each shot about 2000 images. Many were duds with focus and framing issues but many others were great shots, capturing amazing action like never before. Like I usually do with birds in flight, I used multipoint focus and AI Servo with back button focus. I wavered between wide open at f4, and stopping down to f8 in order to decrease the number shots with poor focus. 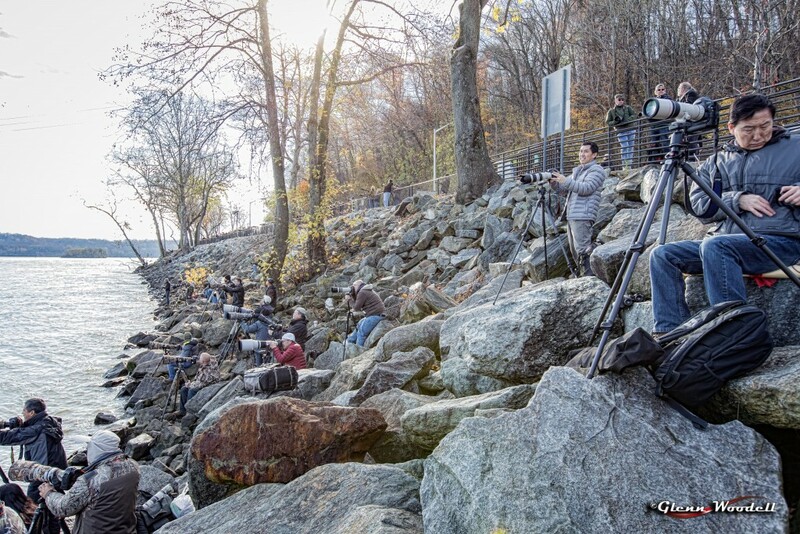 Overflow photographers on the rocks. Click for larger image. I would suggest bringing a folding chair and some snacks since you won’t want to give up your spot once you get set. The late arrivals were frantically searching for good places to set up. 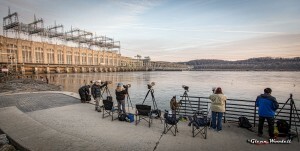 Although you can set up on the lowest level, which is below the rail and toward the dam, you may need to move once the flooding waters rise after the gates are opened. The water can get surprisingly rough and even splash onto your feet a little. One of many juveniles seen at the dam. Click for larger image. There are numerous websites that have all sorts of useful information for shooting here. 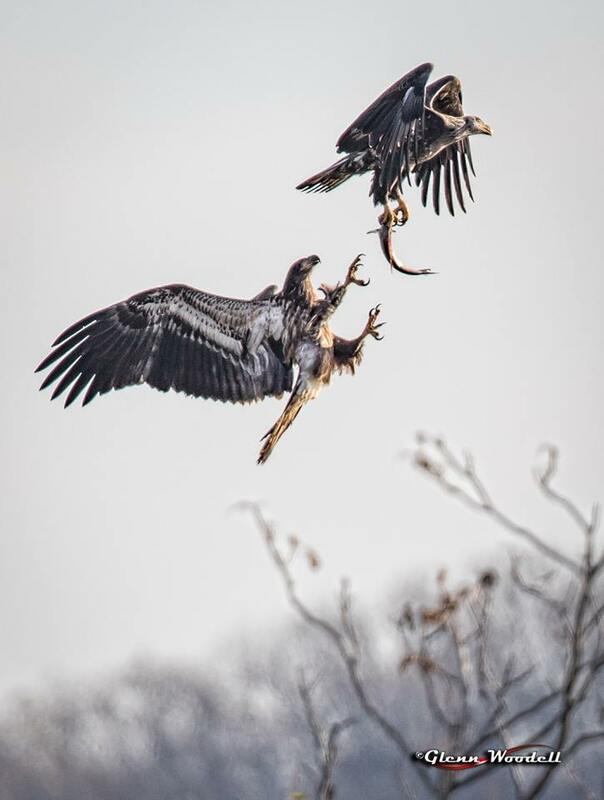 Both the Bella Remy guide and Rick Blom’s guide on the Hartford Bird Club page are worth checking out.